Yesterday was a wonderful day for dividend growth investors. Two of the companies I own announced dividend increases: one was slightly higher than I expected and the other was in the ballpark of my estimate. First up was Aflac (AFL). The Board of Directors approved an increase in the quarterly dividend from $0.39 to $0.41. That's a solid 5.1% increase in the payout which was slightly above what I expected. Nothing spectacular but well ahead of the rate of inflation. Since I own 73.411 shares of Aflac, this raise will increase my forward 12-month dividends by $5.87. Next up was Starbucks (SBUX) that received approval to increase the quarterly dividend from $0.16 to $0.20. That's a whopping 25.0% increase and actually came in higher than I thought as I was expecting a 20% raise. Since I own 56.208 shares of Starbucks, this increase raised my forward 12-month dividends by $9.01. In total my forward dividends increased by $14.88 with me doing nothing. That's right, absolutely nothing to contribute to their operations. Based on my portfolio's current yield of 3.24% this raise is like I invested an extra $459 in capital. Except that I didn't! Two of the companies I own just decided to send more of the profits my way. That's how you can eventually reach the crossover point where your dividends received exceed your expenses. That's DIVIDEND GROWTH INVESTING AT WORK! That's the beauty of the dividend growth investing strategy because you build up your dividends by fresh capital investment as well dividend increases from the companies you own. 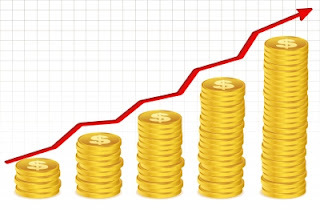 I've already received raises from YUM Brands (YUM), Omega Healthcare Investors (OHI), Kinder Morgan, Inc. (KMI), Visa (V) this month bringing the total to 6 different companies paying me higher dividends. In total my forward dividends increased by $49.07 just for owning excelletn companies. There's no more dividend increases expected for this month, of course today would be the last day to announce one. Looking forward November will be much quieter with just two of my holdings expected to announce increases. My FI Portfolio's forward-12 month dividends are up to $6,029.79 and including my Loyal3 portfolio's forward dividends of $59.55 brings my total taxable account forward dividends to $6,089.34. Did any of your holdings increase their dividends during October? Are you happy with the raises or did they come in lower than you expected? This is turning out to be a great month for your portfolio. Congrats on the raises, JC. Six raises in one month is always welcomed. And considering I didn't get any from my day job it's nice to get a raise from wherever I can get it. What are your thoughts on the future prospects for YUM with China largely out of the picture? I like the combined company because the more stable markets like the US can provide buffers in the times when China/India is suffering. I need to look at it more closely to see the split now but both will probably do well over the long term. SBUX has been great and I think there's still a long growth runway ahead of them. I've been hoping to do the same with my position but there haven't been too many opportunities to do so. I have a feeling it'll probably take the next bear market/recession to really provide a good entry point for shares.